The new system will help naval families struggling with their relationships. Photo posed by models. NAVAL families struggling with military life and relationship woes are to be offered free counselling advice under a new initiative. The Royal Navy and Royal Marines Charity (RNRMC) has teamed up with relationships charity, Relate, to support serving families on the cusp of collapse. The team has launched a new counselling portal online that can help families to mend their bonds before they split. Both serving and former personnel from within the naval service can sign up to the scheme, giving them access to seven modules covering everything from parenthood, military life and sexual communication to intimacy and family life. The news comes after the head of the Naval Families Federation told a committee of MPs she was seeing more and more families ‘breaking down’ because they were unable to spend enough time together. 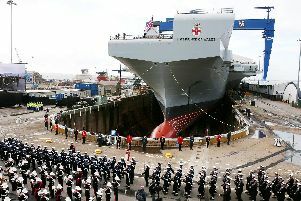 Adrian Bell, chief executive of the RNRMC said the Portsmouth-based charity already offered free phone, face-to-face and online counselling services to naval families. But speaking of the new link, Mr Bell said: ‘The RNRMC is delighted to launch the Building Stronger Families online learning portal. This website will provide discreet and easily-accessible advice to help families overcome the challenges associated with service life. ‘We value our ongoing relationship with Relate to provide first-rate counselling services to serving and former personnel and their families. Ben Collins, director of services at Relate, said the organisation had been working with the RNRMC for three years to provide support to naval families. As previously reported, Anna Wright, chief executive of the Portsmouth-based Naval Families Federation, said she was concerned by the number of ‘dispersed’ families in the Senior Service. Speaking to the government’s defence committee on Tuesday, Mrs Wright said more than a third (36 per cent) of families lived away from the bases where their loved ones were stationed. She warned families were not being given enough time to spend together, which was putting a strain on relationships. The Building Stronger Families portal can be accessed at rnrmc.learnupon.com. For more information visit rnrmc.org.uk/relationship-support.